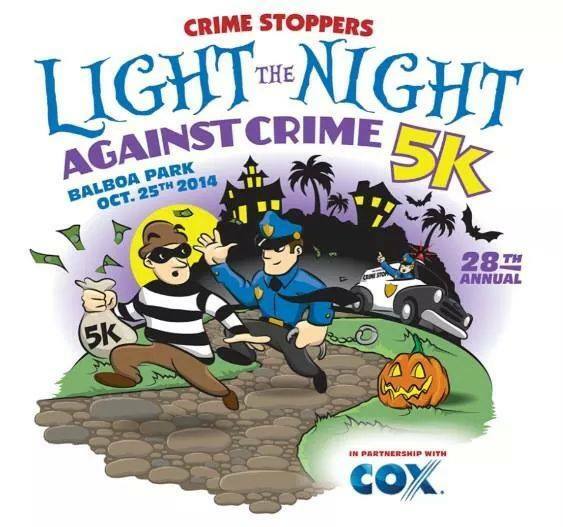 Light The Night Against Crime 5K October 25, 2014 Balboa Park! ONLINE REGISTRATION CLOSES AT 11:59 PM, ON 10/24/14. HOWEVER, STAY CALM BECAUSE YOU CAN STILL REGISTER ON SITE AT BALBOA PARK STARTING AT 5:00PM ON RACE DAY! On October 25TH, San Diego County Crime Stoppers will host its 28th Annual “Light the Night Against Crime” 5k Run/Walk at Balboa Park! This night-time event is a fun, family-friendly evening featuring a costume contest, music and pre- and post-race festivities. It’s a great opportunity for families to come out together and enjoy an evening in the park. Each runner receives a high quality dryfit short sleeved T-shirt! Award metals will be given to the top 3 in each age group at the event. It's Halloween time, so dress up! Make sure that it's easy to run in! There will be an exciting expo with a 'haunted bus', law enforcement displays & demonstrations! The expo will be open from 5pm – 9pm. Sign up and bring some pocket change...there will be food too. Proceeds benefit San Diego County Crime Stopper's Felony Crime Reward Fund and its community education program. San Diego County Crime Stoppers is celebrating their 30th year anniversary, so come on out and show your support. Older PostFBI Seeking Info On "Satchel Bandit"